"But not all dogs stay there!" 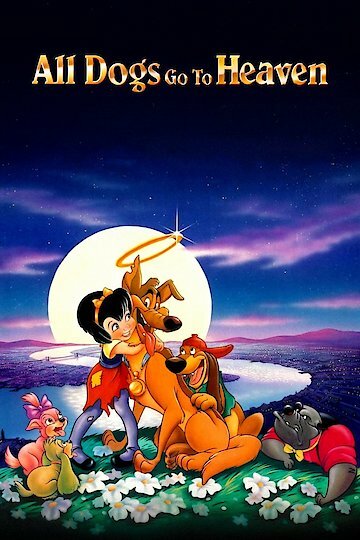 In this animated film, a good-hearted dog decides, when he is killed by a rival, that he'd rather return to Earth to be with his friends than to take his rightful place in Heaven. Back in the land of the living, the dog learns important lessons about life, loyalty and love. All Dogs Go to Heaven is currently available to watch free on Tubi TV, Pluto TV, Vudu Free, YouTube and stream, download, buy on demand at Amazon Prime, Amazon, Vudu, Google Play, FandangoNow, iTunes, YouTube VOD online.